Looking at the number of Children Gyms, indoors playground and Activities Centre coming up close to us, I always envy how fortunate the kids are these days to have such facilities readily built for them and to look back in my time, we never got any chance to even step into one. 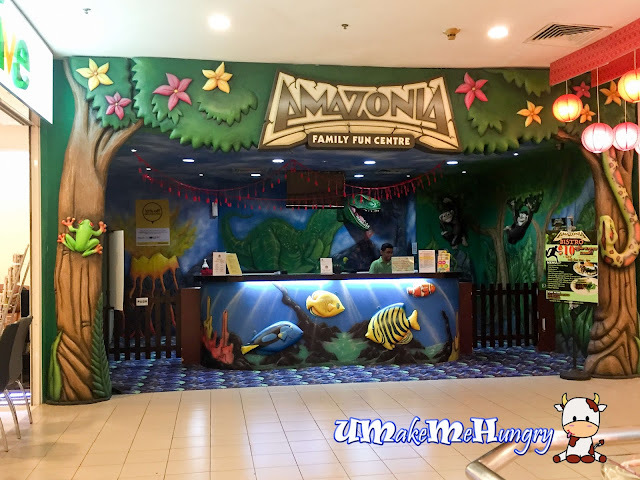 The trip to Amazonia had somehow rekindle the fun times of my childhood and the happy looks of cute little toddlers/children running around in the centre had never failed to brighten up my day. Amazonia is conveniently located at Level 3 of Great world City, ajacent to V.Hive Furniture. The idea of incorporating a Bistro to the Fun Centre was definitely a very good step forward for such activities centre in terms of the market requirements nowadays. 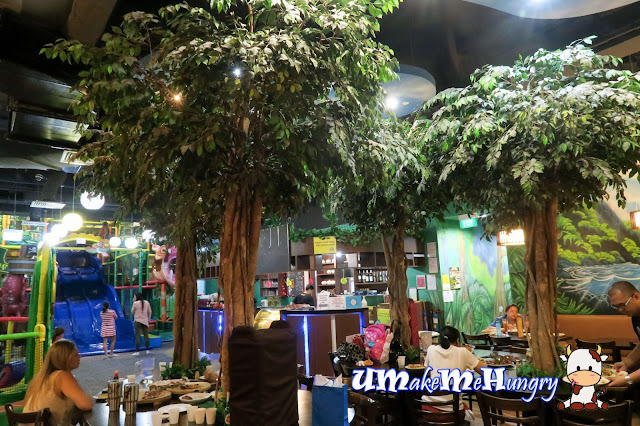 Further more, the Jungle Themed bistro is a good place for parents to rest and relax under the shades while watching their children enjoying their fun time. 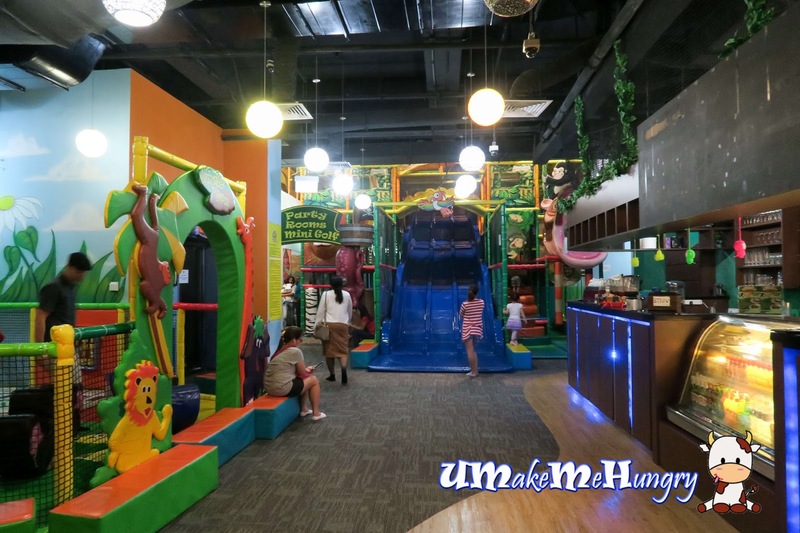 The 400 square metres gym is equipped with an 8 meter high slide shown in the middle of the picture and completed with tunnels, suspension bridges, ball pit and even trampoline to excite children from ages 3 to 12 years. 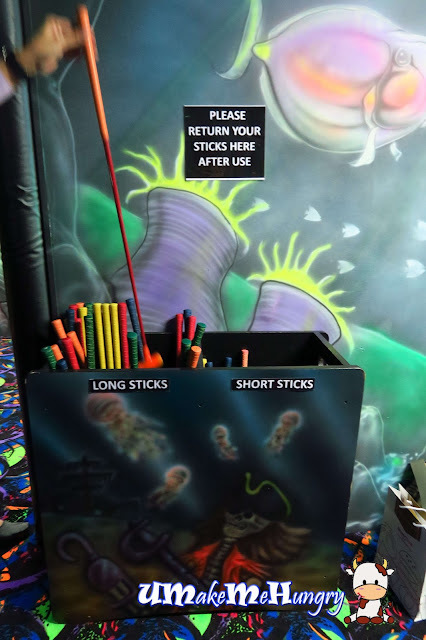 Turn the session into an interactive one by joining your toddler in the Soft Play Section. Parents can enjoy from a selection of pasta, sandwiches, local delights or even light snacks with their kids. Cooling and refreshing Apple Juice which tasted similar to one of the brands from the Supermarket but in a diluted form. 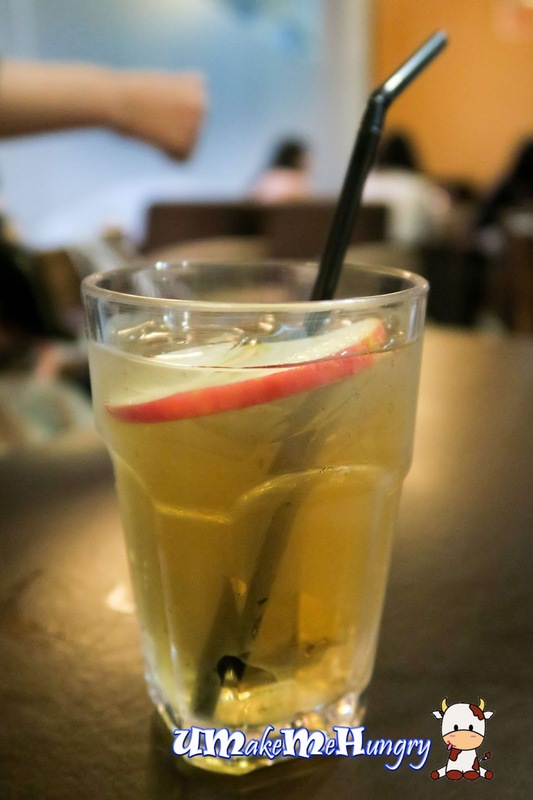 A slice of apple is also included in the drink. 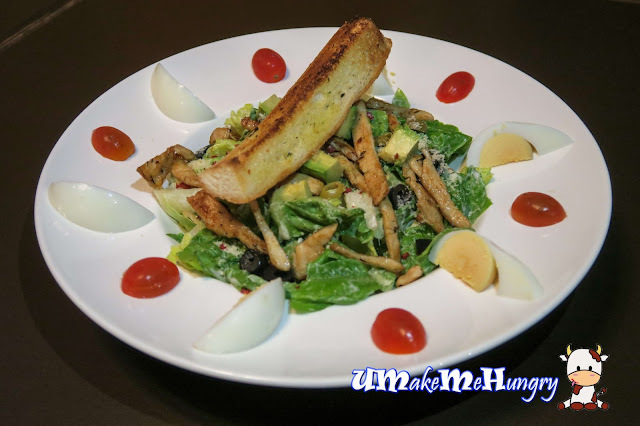 Starting our appetizer with the Chef Recommended Ceasar Avocado Salad which includes refreshing crunchy Romaine lettuce, sliced Avocado, olives, cherry tomato, hard boiled eggs, grated cheese, bacon bits, garlic croutons and grilled chicken breast in Ceasar Dressing. Such appetizer is light and hearty in preparing to welcome the main courses. 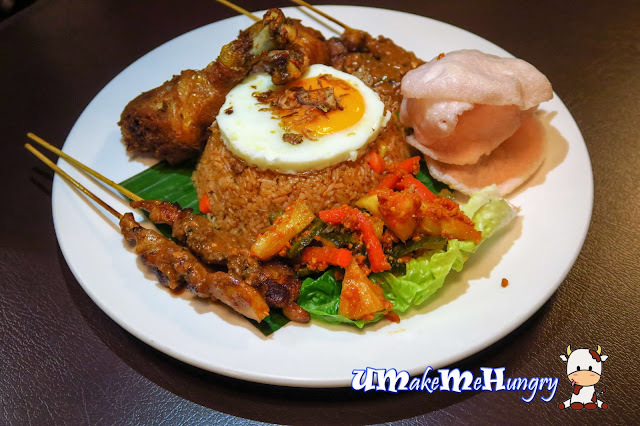 Another recommendation from the Chef is none other than the popular food known in Asia, Nasi Goreng (Fried Rice). Color presentation of the food alluring besides the food items on plate. Being truly Asian, you will get to see familiar items on the plate like mild spicy Nasi Goreng, fried chicken drumstick, chicken satay, sunny side up egg, keropok and Ah-Char. Satay was undeniably good in its tender meat and tasty marinate which made us could not resist, thus requesting for separate Satay helpings. While the drumsticks were huge and dressed in its glistering "suit", its meat was quite tough and we had took some time to battle with it. 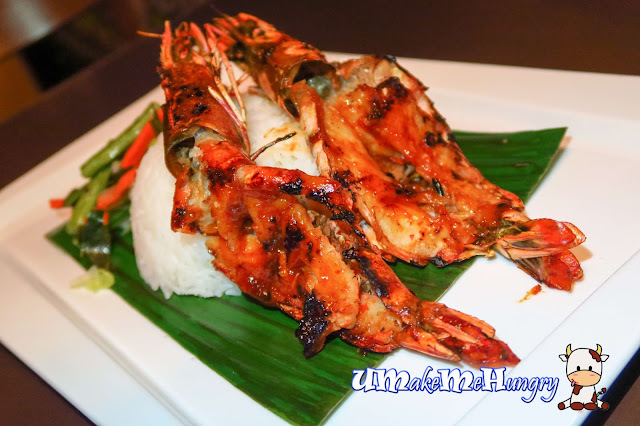 2 Pieces of marinated tiger prawn was grilled in garlic sweet and spicy sauce. Together with the spicy kick of the Sambal Chilli, it was very tasty and definitely spelled out the characteristics of our local delicacy with banana leaf as base. 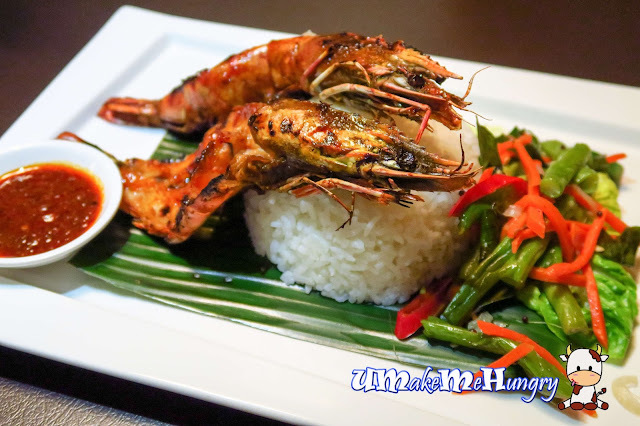 On top of having the prawns, freshly cooked vegetables were served with steam rice too. Could you resist such temptations? Here comes the sweet treat after finishing the mains. 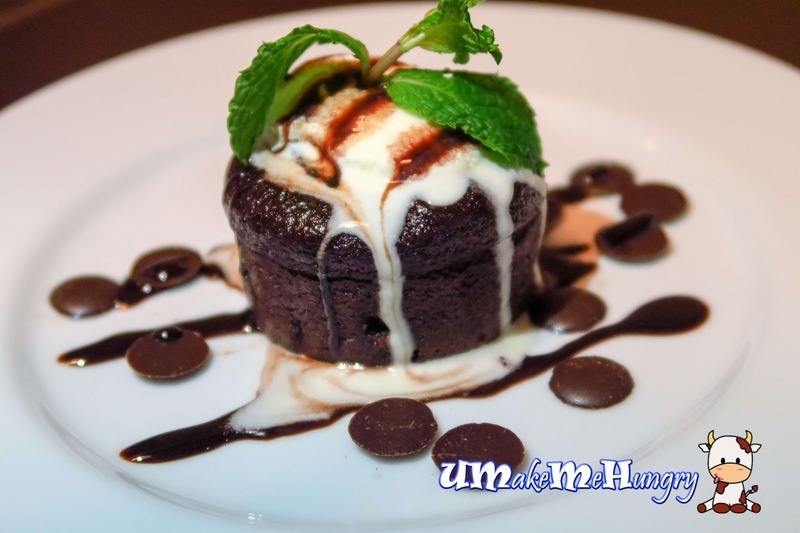 Chocolate Fondant topped with vanilla ice-cream is a perfect closure to the meal. The ice cream was adorn with mint leaves and the dessert was surrounded by button chocolates and chocolate fudge on the plate. Cake was moist and with rich semi sweet chocolate fondant in it. Yummy! Amazonia Bistro is not limited to the kids as they have also extended their invitation to nearby office working class for an Office Express Lunch from 12-3pm with games to destress themselves. 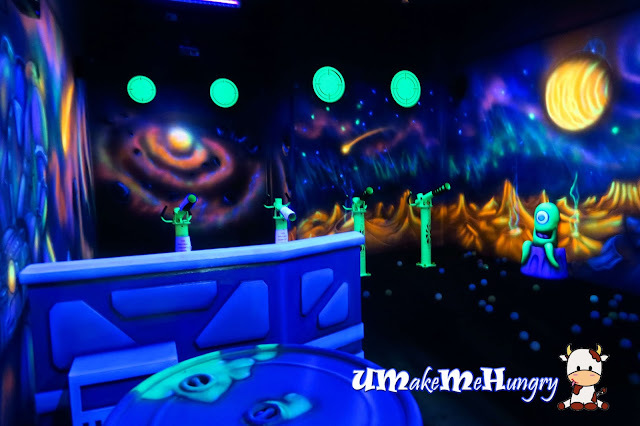 Personally, I enjoyed the most from the space ball room. Room was painted with their special glow in the dark artwork. illustrating a wonderful space environment with a resident alien watching over its territory. Room was equipped with 8 hydraulic driven cannons and an electronic scoreboard that will reflect the scores instantly once you hit the target / enemy. Come on, let's shoot the enemy with the softballs! 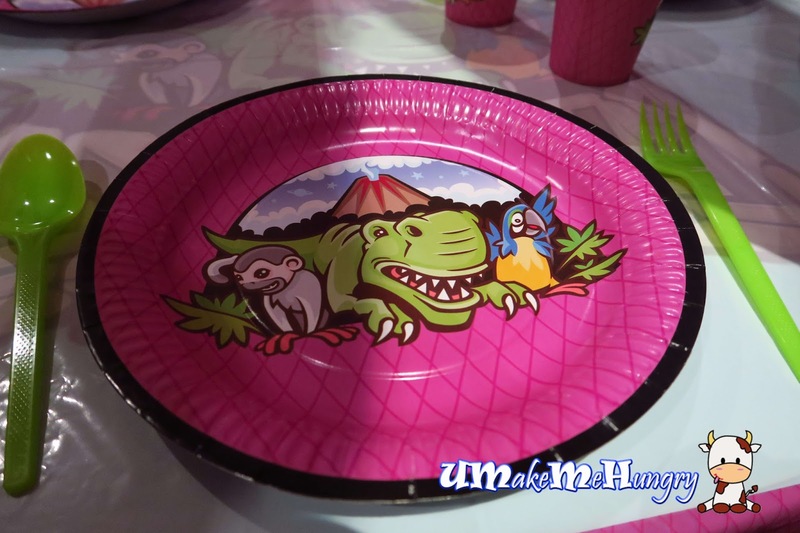 You can also get a party experience in Amazonia for your kid's birthday. 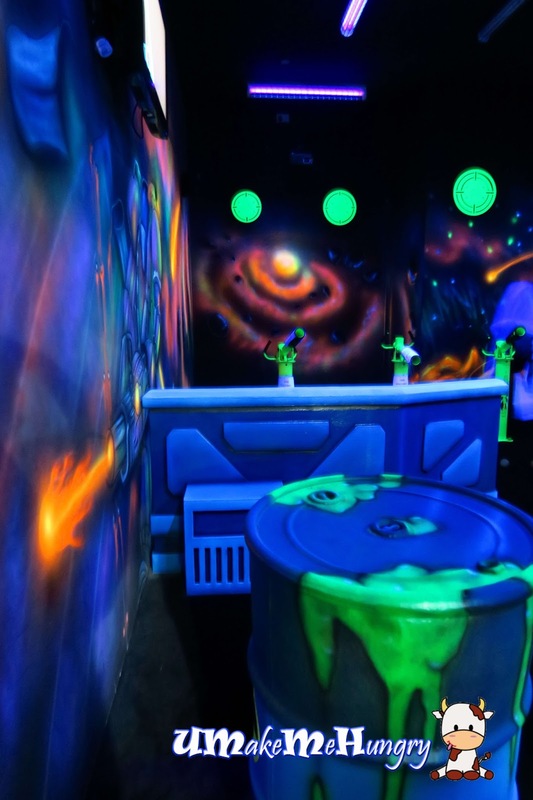 They have 2 theme party rooms, one for the boy and the other for the girls holding up to as many as 40 children. Scheduled with interesting games and activities, Amazonia will leave a good memory on your child's special day. Take a look at the Amazonia a racing car theme room all prepared for the boys. 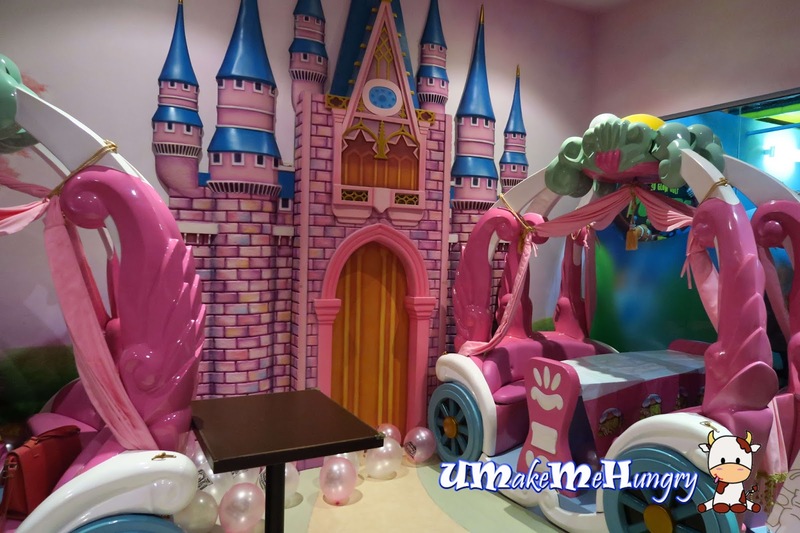 Whereas for little girls, they can enjoy themselves as princesses in the castle and get to dine on the beautiful pink carriages. Envy not? Do take note that there are designated party hours slots to follow, so book in advance to avoid disappointment. 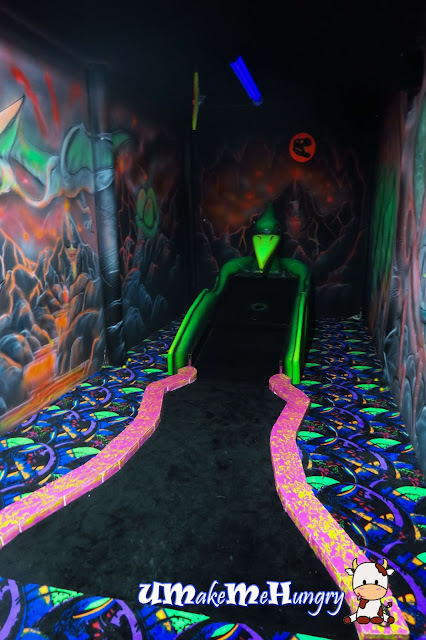 Last but not least, a 3D Glow Golf indoor 9 putting course suitable for children age 4 and above, also applicable for family fun . 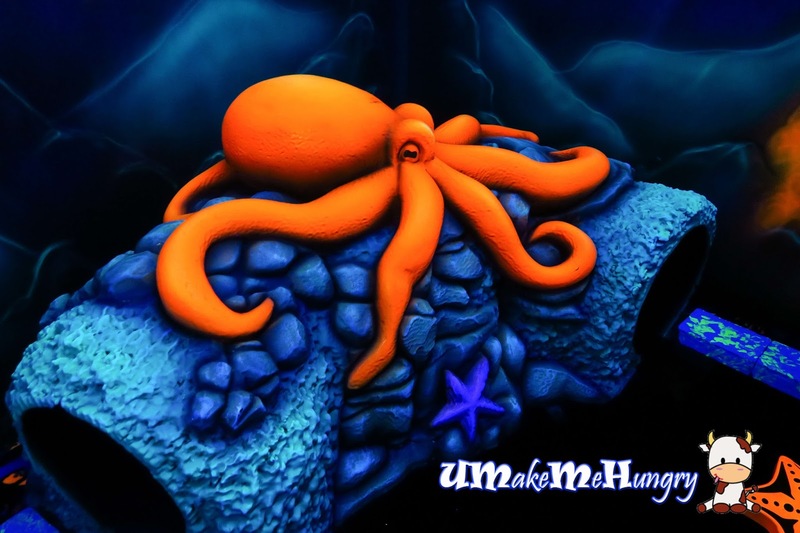 Similar to the Space Jam, environment is dark with glowing artwork. You will get to see moving props in theme like Pirates, Sea Creatures and Dinosaur. I'm pretty amazed by the props, fun and amount of space used in designing the entire entertainment centre. 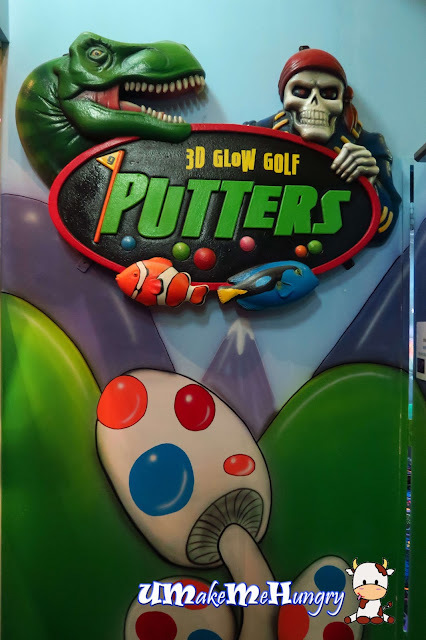 With the bright and colorful ambiance, I simply could not resist to play a few rounds of golf. 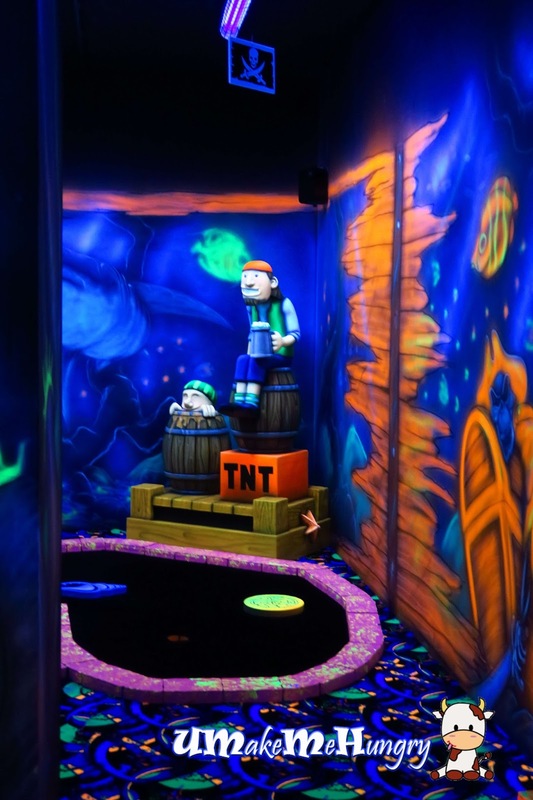 Having fun is of no age limit, so let your hair down and have fun! Lights up! After golfing, please remember to return your sticks here. Come this July, they will be marking their 5th Anniversary. 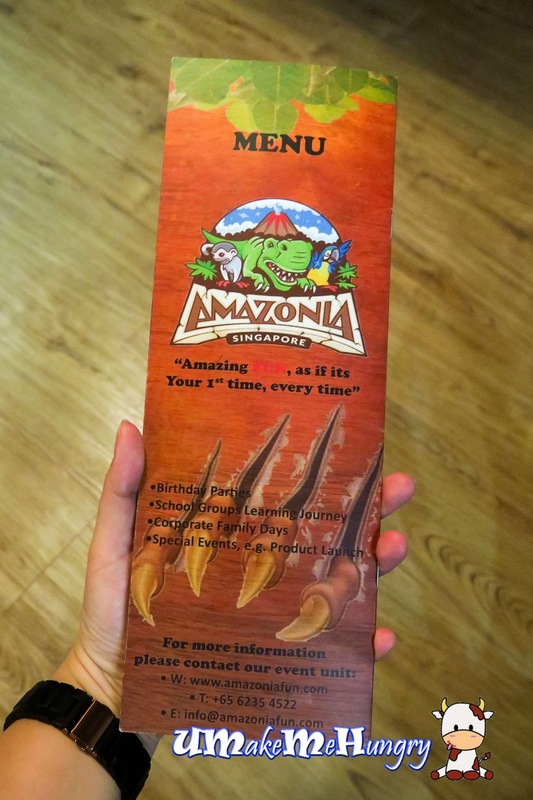 With such successful concept in Singapore, Amazonia has spreaded it wings into Jarkata, Indonesia which has 4 times the space of current location in Singapore. Other than kids party and school group's learning journey, they are open to corporate group dynamics, events like team building, thus if you think that Amazonia is only for kids, its not so in this case!